Usually, “The Larry Corley Show” on WQNA — which reaches 250,000 listeners in the greater Springfield, Ill., metro area — finds host Larry Corley talking to jazz greats. But even jazz guys can dig monsters. 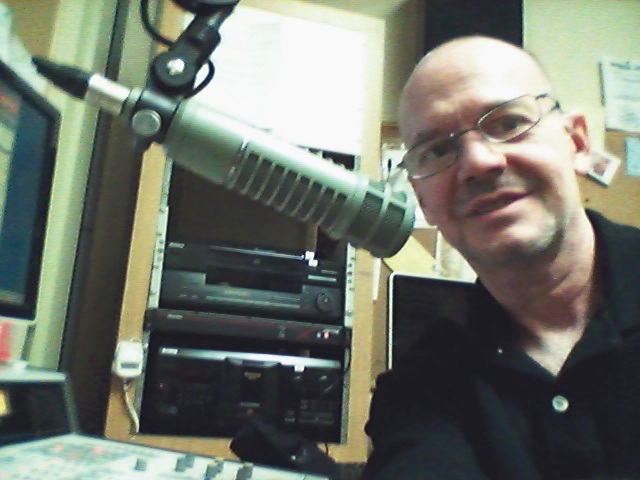 Larry switched gears with a segment about “Monster Mash.” His interview with me aired on Nov. 19, 2015. The audio is presented below in two parts. Larry rebroadcast the interview on Oct. 27, 2016, for his Halloween special, followed by his interview with Christopher Lee! An abridged transcription of Larry’s interview with me follows. Q. What brought about the idea to produce this book? Larry Corley is the host of “The Larry Corley Show” on WQNA-FM in Springfield, Ill.
A. I’ve always loved monsters, since I was a kid. I was born in ’58, so by the time I was 4 or 5, monsters were everywhere. If I walked into a drug store with my mom, there were monster trading cards, monster magazines. If I walked into what passed for a department store back then, there were monster model kits. I couldn’t read yet, so I would pick up these boxes of the model kits of Frankenstein, Dracula, the Wolf Man. I didn’t know what a model kit was, so it just seemed to me that they were selling monsters in a box. They had really cool artwork on the cover, paintings in color of these really garish monsters. But I couldn’t look inside, because they were sealed in cellophane, which only heightened the mystery. The first monster movie I ever saw, finally, was “Abbott and Costello Meet Frankenstein” (1948). I was spoiled out of the box, because this one movie had Frankenstein, Dracula and the Wolf Man, and played by Bela Lugosi, Glenn Strange and Lon Chaney Jr. So they looked like the model kits come to life, or the magazines covers come to life. And I just thought, “Oh, wow!” I was hooked, and I still am. Q. Well, “Abbott and Costello Meet Frankenstein” is certainly one of my favorite movies of all time as well. It’s just a great, fun movie. But what brought about the whole Monster Craze? Because you actually list the years of the Craze between 1957 and 1972. Was it the release of those great classic movies to television? Was that what brought about the Craze? 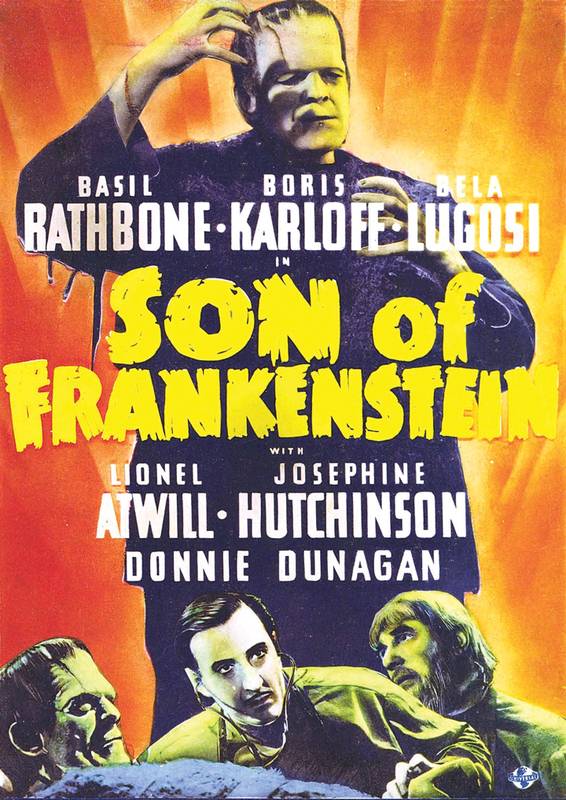 Corley cited “Son of Frankenstein” (1939) as a monster movie that holds up to this day. A. That’s what did it in a big way. That was the “big bang,” Larry. The kids were seeing them for the first time, and their jaws just dropped. They’d never seen “Frankenstein,” “Dracula,” “The Mummy.” One station reported more than 1,000 percent increase in ratings from the previous week’s. So that was the first true sign that there was money in monsters, and that the kids wanted this stuff. Q. And those movies really hold up. They’re very atmospheric. It’s really a wonderful craft of storytelling. I was watching them at Halloween, and really enjoy some of these — “Son of Frankenstein” and so on. Is that part of the appeal to kids, is that they’re so eerie and just draw the viewer in? A. Absolutely, Larry. You mentioned “Son of Frankenstein,” for instance — 1939, which is called “Hollywood’s greatest year.” This was a true product of Universal Studios, the studio system. Basil Rathbone as the title character, Wolf Frankenstein. Boris Karloff playing the monster for the third time. Bela Lugosi, best known as Dracula, but here playing Ygor, the mad shepherd with the broken neck. They don’t make movies like this anymore, and they absolutely hold up. There are fans of these movies yet unborn. Q. What is the story about the Aurora model kits? You have some wonderful artwork here of the Aurora models of Dracula and these classic monsters. How did Aurora tap into that? Was there reluctance on their part at first, to think that this kind of model kit would fly with kids? A. Aurora was very reluctant to do this. They had specialized in airplane kits beginning in 1952. But they were looking to branch out, and they did their first-ever (customers) poll, and the answer came back: monsters. So they tried it with one kit. The kit was Frankenstein. They soon found that for a while, they had to run 24-hour shifts at their factory in West Hempstead, Long Island, to keep up with demand. After the Aurora kits came out, then you had all kinds of things: board games, puzzles, comic books, magazines, the flood of merchandise. Q. I’ve gotta take my hat off to Aurora for the artwork on those boxes. You’ve talked with many of the artists involved with Aurora and other toys and other products. How did they come up with the idea? Was it from the movie stills? Because they’re really colored and exciting images of images that we would have seen in black and white on television. A. The artist who painted most of the Aurora boxes was a gentleman named James Bama, who is still with us. He’s actually a very famous artist, not necessarily for the monster kits. But he is considered America’s great delineator of the Old West, on a par with Norman Rockwell. If you can picture paintings of the prairie and Indians with lined faces and detailed feathers — he’s the guy that does that. It’s very much Americana. But he says that the world can come to an end, but the Aurora monster model boxes will last forever (laughs). Of course, he says that with chagrin, but he’s absolutely right. To us, to the kids that loved this stuff back in the ‘60s, this was art to us. This belonged in an art museum. And he thinks that they’re so popular and enduring because they were in color, because the monster movies were all in black and white. He says that for the first time, you were seeing them in color. Actually, Famous Monsters magazine (which had color covers) pre-dated the Aurora kits. But this time, these kits were in stores, so it really was the first time, for many of these children, that they were seeing the monsters in color. Q. And what a great opportunity for kids to have an activity. This was something that came with all these various parts, and they could piece them together. And it was not your standard, like you said, airplanes or cars or things that had come before them. This was something really creative in terms of painting. You’ve got a skeleton with ripped clothes; you’ve got witches; you’ve got all of these various pieces. It certainly gave children something to use their imagination. There was one kit that I understand was kind of controversial, and that involved the guillotine. Can you tell me about that? A. Sure. The Chamber of Horrors Guillotine was put out by Aurora. I think they thought they were safe, because they had earlier put out a Hunchback of Notre Dame kit. The Hunchback passed muster; after all, it was based on classic literature, Victor Hugo. And also, the Anthony Quinn film, that didn’t pre-date it by too much, had been a big Hollywood hit. Nevertheless, the Hunchback was depicted with fresh whip marks on his back, and he was bound. So he was tortured. But that didn’t draw parental ire. But the Chamber of Horrors Guillotine kit did, because the blade actually came down and “chopped” off the man’s head. It landed in a basket. And then you could re-set it. Actually, I have never witnessed it in person. I’ve seen it on YouTube, and I have a friend who had the kit when he was a kid. He said that he painted it all up with red blood, so sometimes the head would stick. Q. I presume that if people can find these kinds of materials today, that they are collectors’ items, and they can be pretty pricey. Would that be right? A. Oh, yeah, original kits are very pricey. Especially unbuilt, unpainted. That’s very, very rare. But I’m grateful that some companies later did reissues, Playing Mantis for one. They did reissues struck from the original molds. Usually when I collect, I like to get the original. I don’t like reprints; I like to have the real thing. But in the case of the monster models, it’s an okay exception with me, because once they’re painted and glued, they look the same (as the originals). Q. The array of material in here is just staggering. You cover the Castle Films, which were Super 8, silent, edited versions of these feature films. 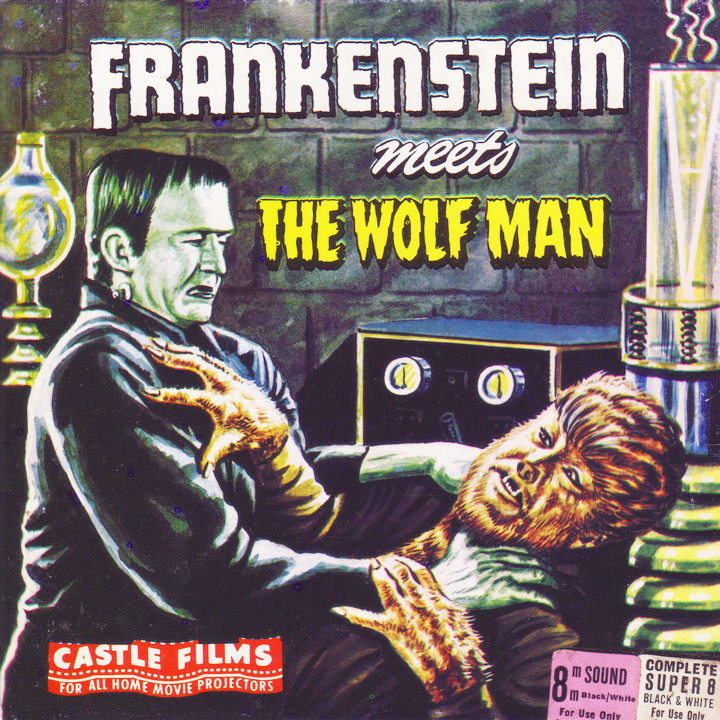 You could get “Frankenstein Meets the Wolf Man,” “House of Frankenstein,” for example. So this kind of appeased people in between television showings, I guess, for those who happened to have home projectors. A. Absolutely. Of course, nowadays, a kid can — I say “a kid” — anybody can pull a device out of their pocket and dial up “Frankenstein Meets the Wolf Man,” the real thing, and watch it. Put in some ear-buds. But back then, the opportunities were so rare. There was a kid in my neighborhood who had a projector. Once in a while, he’d put on some shows for us. He didn’t have the horror movies; he had cartoons, like “Looney Tunes” and things like that. But it was really something to see it and to know: This isn’t being broadcast. It was a private viewing. There was really something thrilling about it. And you could watch it again. Because in those days, there was no VHS or DVDs, where you could rewind. You watched it once. That was your one chance. If you fell asleep, you might have missed Frankenstein killing somebody. You’d keep your eyes open with toothpicks. Q. Just the wide variety of merchandise you depict in the book — because monsters made their way into toys, into games, Halloween costumes, comic books, trading cards. And then of course, we had those two monstrous TV series in the 1960s, “The Munsters” and “The Addams Family.” Were those a result from this Monster Craze? A. Yes, and they happened nearly simultaneously. 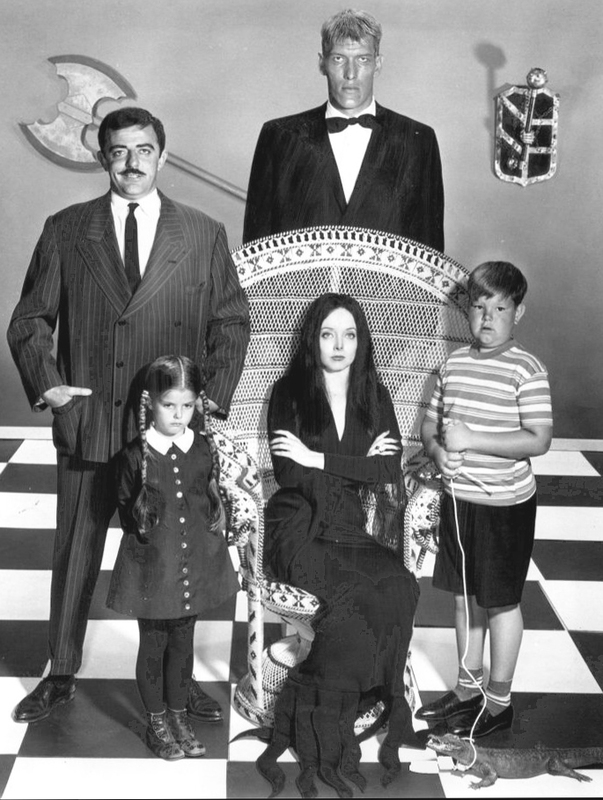 The two series, “The Addams Family” and “The Munsters,” debuted within days of each other. They’re two-season wonders, and yet, we’re still talking about them years later. There were many remakes — new television series, movies based on the characters, a Broadway musical based on “The Addams Family.” They’re not going away, and the originals are still the best. But these are the things that sustained that Monster Craze. A lot of fads from the ‘60s died a quick death after a year or two, but the Monster Craze kept being reignited by “The Addams Family,” “The Munsters.” There’s a lot of merchandise based on those shows. After they were cancelled, it could have ended there, but then “Dark Shadows” came along. Once Barnabas Collins, the vampire character, caught on, once again, there was a flood of merchandise. “Planet of the Apes,” the same thing. These franchises — and the word “franchise” wasn’t used this way back then — kept reigniting the Craze and giving it new life. Q. We could probably use the term “cult classics” in those cases as well. Because there are people, to this day, who collect and watch “Dark Shadows.” It’s got its own following, and so does “Planet of the Apes.” There are people who really highly prize all the merchandise associated with those franchises. 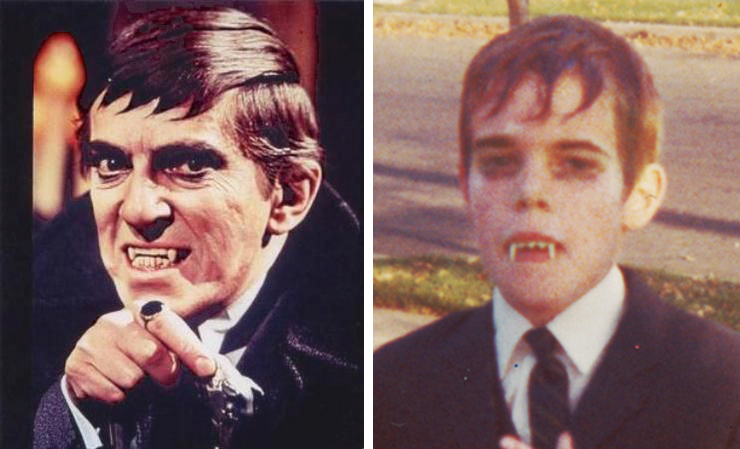 Apparently, “Dark Shadows” had a large impact on you, because you were Barnabas Collins at Halloween. That picture’s in the book. Can you tell me about that? Corley brought up my “author photo” of me dressed as Barnabas Collins on Halloween 1968. A. That’s my author photo, because who wants to see the way I look now, Larry? I think it was 1968. I was 10 years old. I used my father’s putter for a cane. Barnabas had this really cool ring on his forefinger, so I got a Crackerjack ring and painted it black, like Barnabas’ ring. I put shoe polish in my hair for the little strands of hair that Barnabas had. And dime-store fangs finished it. I was Barnabas for a day. Yeah, that was a happy day in my life. Yeah, he was my hero. Q. Then in the later ‘70s, we get into the blaxploitation, the “Blacula” and that kind of thing. So that’s even furthering the monsters. It seemed like everybody wanted to get in on that by that time. But that was getting to the end, I think, of the Craze at that point. A. Well, I draw the line at 1972. I knew that some people wouldn’t agree with me. It’s easy to agree on when a craze starts, because there usually is a “big bang.” Like, the Silver Age of Comics began in 1956 with “Showcase” #4, the first appearance of the Silver Age Flash. So it’s always easy to pick that, but where does it end? People draw the line at different places. I picked 1972 because – well, for one thing, Larry, it was a ‘60s movement, it was a ‘60s craze. But it didn’t begin on Jan. 1, 1960, nor did it end on Dec. 31, 1969. And also, I think it’s marked by innocence and naivete. I think there’s a sweetness to it. Once you had movies like “The Exorcist,” especially — I don’t have to go into detail there — and “Children Shouldn’t Play With Dead Things” (both 1973), that’s where the worm turned. But like any good craze, it never dies. But I cite 1957 to 1972 as the golden age of that craze. Q. The visuals in the book, the merchandise that you have pictured — is most of this your own collection, or is this an amalgam of other people’s collections? A. A lot of the stuff is mine. I have a really healthy collection of the Warren magazines — Famous Monsters of Filmland, Creepy, Eerie, Vampirella, Monster World. I have a lot of the comic books, some of the model kits. I bought the Uncle Fester puppet for the book. I had to get him in the book. So I think it’s a pretty complete look at all of it from that period.